On March 11, 1982, the two martyrs of Motihar at Rajshahi University. Shaheed Jahangir Alam and Shahid Abdus Shakur After the SSC examination, Shaheed Abdus Shakur came from Chapainawabganj to Rajshahi. There he stayed for two days in Rajshahi city. Later, he went to his friend Dinar’s house in Darusha village of Paba thana. After eating at night, some of the neighboring Shibir activists including Shaheed Jahangir and others gathered around for discussion and story. But their joyful moments did not last long. At around 12pm, the Awami terrorists suddenly bombed them. 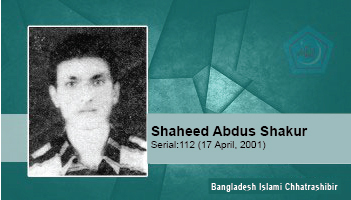 Abdus Shakur was martyred on the spot. The injured were admitted to Rajshahi Medical College Hospital. Among the injured were Shibir activists Jahangir, Rubel and Mokhles. On April 18, at 10.30 am, Shaheed Jahangir attained martyrdom. Permanent address: Village- Chhabania, post office- Kalinagar, Thana and District- Chapainawabganj. illage- Chhabania, post office- Kalinagar, Thana and District- Chapainawabganj.